Sooam Biotech Research Foundation ▸ Want a clone of your favorite dog for $100,000? | Want a clone of your favorite dog for $100,000? | Want a clone of your favorite dog for $100,000? Want a clone of your favorite dog for $100,000? If you had the money, would you pay $100,000 to have your favorite pet dog cloned? Apparently those with a lot of extra cash to dispense with, wouldn't hesitate to shell out that amount just to have a clone of their pet dog. There's an organization in Seoul, Korea named Sooam Biotech Research Foundation that will do that for you. Running a very successful business model for the past 10 years, Sooam caters to pet owners who just can't let go of their pets. At $100,000 for every clone of a pet dog, its list of clientele include billionaires, celebrities, and members of royal families. But Sooam Biotech's client list also includes state agencies who want to have a clone of their best sniffer and rescue dogs. The most famous rescue dog cloned at the facility so far is Trakr, a search and rescue dog who found the last survivor of the tragic 9/11 terrorist attack on New York's World Trade Center. Sooam delivered five clones of Trakr, collectively known as "Team Trakr", in honor of Trakr's heroic legacy. The facility has reportedly cloned about 800 dogs since 2006, and requests from around the world continue to pour in, especially from North America. Wang Jae-Woong, the spokesman for Sooam Biotech, was quoted by CTV News as saying that clients "understand that a clone is an identical twin of the original pet, but also has a lot of genetic predisposition and the potential to develop as the original pet." Though its dog cloning service is the most popular, Sooam Biotech also produces genetically-engineered animals known as "disease models", for medical research purposes. Disease models are animals predisposed to certain diseases like tumors, diabetes, Alzheimer's and some cancers. The foundation is also pushing an effort to bring back the extinct mammoth, can you believe that? The dog cloning service is too expensive for ordinary people to afford. Converted to Philippine peso, that amounts to Php 4.71 million. For that amount, one can already own a house or a condo unit, or a luxury car. But for pet owners who can afford it, $100,000 is a "reasonable" amount, since it gives them a chance to be with their favorite pet again. If you're interested in cloning your pet, Sooam has a website (sooam.com) which includes specific instructions on how to preserve live cells of your pet for 5 days. 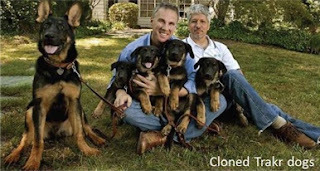 Home » Sooam Biotech Research Foundation » Want a clone of your favorite dog for $100,000?